Working for yourself can be the best solution for people whose health limits their options, as can be attested to by Outset Swindon’s 100th business owner. Ali Celiker, who suffers from Scoliosis, was 13 when he left Turkey with his family and moved to the UK in 2004. At the time, he only spoke Turkish and German, but he learnt English very quickly after starting school. Following the completion of his BTech in IT in 2012, Ali started looking for work, but it was difficult to find something appropriate because his Scoliosis restricted him to sedentary work. He had always been interested in computer technology but it was only after a conversation with his brother about successful online platforms, like Facebook, that he started to think about web design and development. In his spare time, he researched the industry, started building test sites and studied graphic design in order to improve his skills. After two years spent looking for work without success, Ali decided to investigate the possibility of setting up his own business as a website designer. This would have the advantage of allowing him to work in an environment that suits his health while doing something he loves. He discussed his idea with his local Jobcentre advisor, who then referred him to Outset Swindon for business start-up support. After an initial one-to-one meeting with an Outset Enterprise Advisor, Ali signed up for Outset’s Business Start-up course. The workshops gave Ali all the information he needed for running a business, including sessions on advertising, finance, how to approach customers and tips for making a sale. Ali particularly struggled with calculating a cash-flow forecast, but his advisor went through this with him in a one-to-one session to help him understand. Ali’s market research revealed that a lot of small businesses are not able to afford a website because it is too expensive. Similarly, business owners do not want to pay for a simple website with just a few images and text that will soon become out of date. Ali identified the need for a service providing professionally-built modern websites, that are future-proof, at accessible prices. Having completed his business plan with Outset’s support, Ali registered his business, ‘Got2Team’ in July this year. His goal is simple: to provide professional yet affordable web and graphic design services. 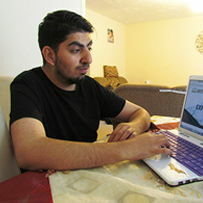 But web design and development is just the beginning: next year, Ali plans to add app development to his services. His goal is to start in Swindon and gradually expand the company and take on clients from around the world. In the longer term, he’s hoping to secure some contracts with big brand clients.